These two lovely girls spent one year together in our Center in Amorgos. 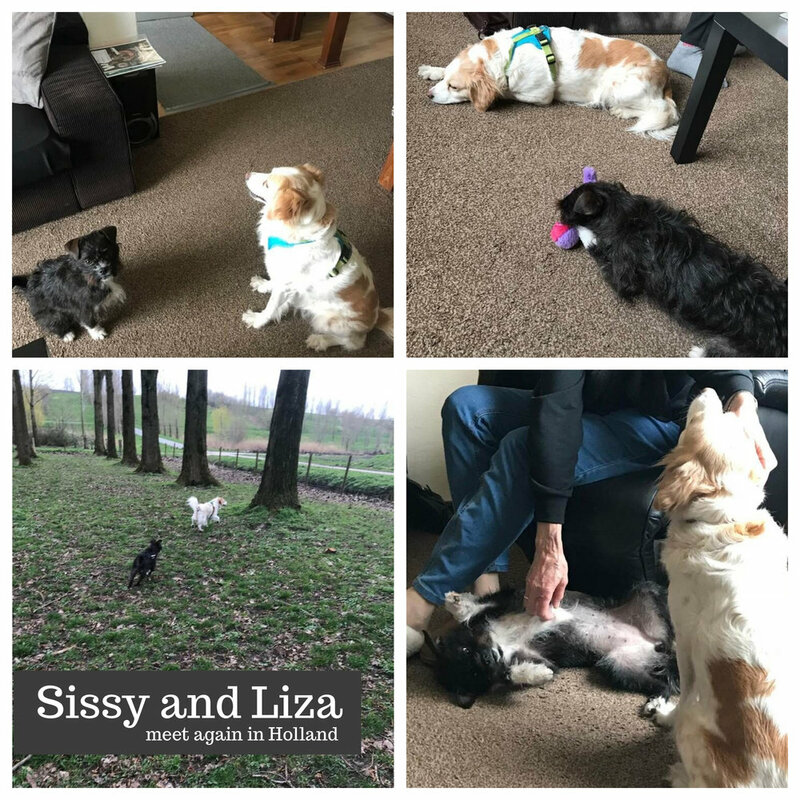 But then Liza was adopted into a wonderful home in Holland and Sissy was adopted into another wonderful home in Holland and the best friends were separated. After a few months their wonderful mothers gave Liza and Sissy the gift of a playdate and the girls were so happy to spend time together. We miss these beautiful girls but know that they are enjoying a loving and happy life in their new country. We want to thank Linda and Henriette—the most wonderful moms who are raising our girls with love and kindness. 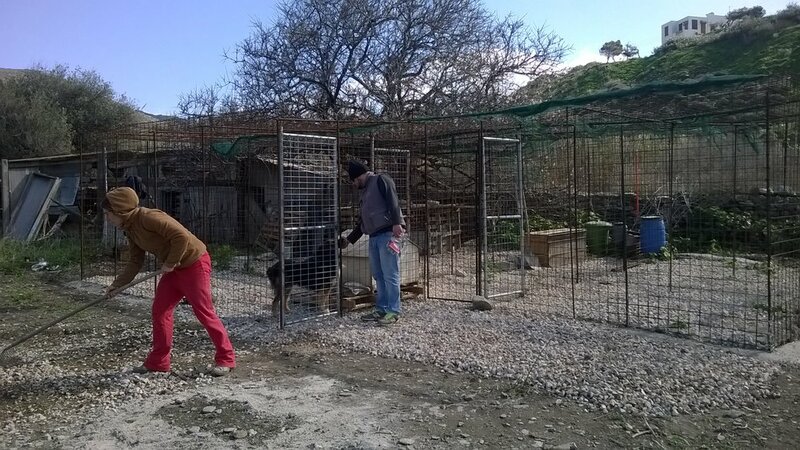 Lisa was found in terrible condition after having been locked for years in an improvised cage in Chora. Lisa was close to death when volunteers and members of the local animal welfare society (Filozoiki Merimna of Amorgos) began to fight for her life. They not only had to fight for her health, they also had to fight the owner who refused to let them remove her from her cage and bring her to our Center. After nearly five years with us, Lisa has finally found her new home in Holland where she will be given the love that she so greatly deserves. Lisa is a special creature filled with a nurturing spirit that caused her to care for all the orphaned and ill animals that came to us at our center. Lisa would leave her own bed and sit with these wounded animals and she will always live in our memories as the most beautiful and powerful example of the grace that can come from the commitment to save every broken and wounded member of the animal kingdom. We wish you a long and happy and wonderful new life dear Lisa!! Do you remember sweet Bobbie? Bobbie was found abandoned as a puppy and spent the next 2 and a half years waiting for his forever home. On March 23rd Bobbie and his brother Arangon traveled from Amorgos, where their lives had no future, to Holland, to start a life as a member of a family, inside a home. We've heard nothing but good news about his new life, and here is the proof...! A look back at the many dogs we have rescued over the years, in conjunction with the Amorgos Animal Welfare Society. Won't you consider giving him a home? 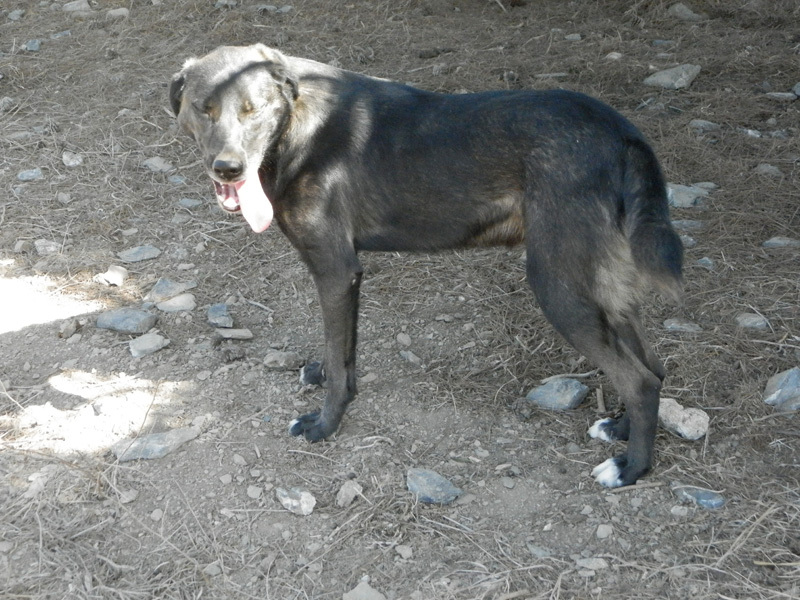 Bob was one of the five small puppies who were abandoned last year outside of a field in Amorgos. After many months with us, a local family of shepherds asked to adopt Bob and begin the work of training him to watch over their herds of goats and sheep. Although we told them that Bob loved to chase anything that moved they assured us that they would be able to turn him into a good watchdog. Unfortunately, Bob was very happy to chase the herd but not to control it, and, so, after two months, Bob came back to us at the Center. He is now a very sweet and smart boy who loves to be with people. 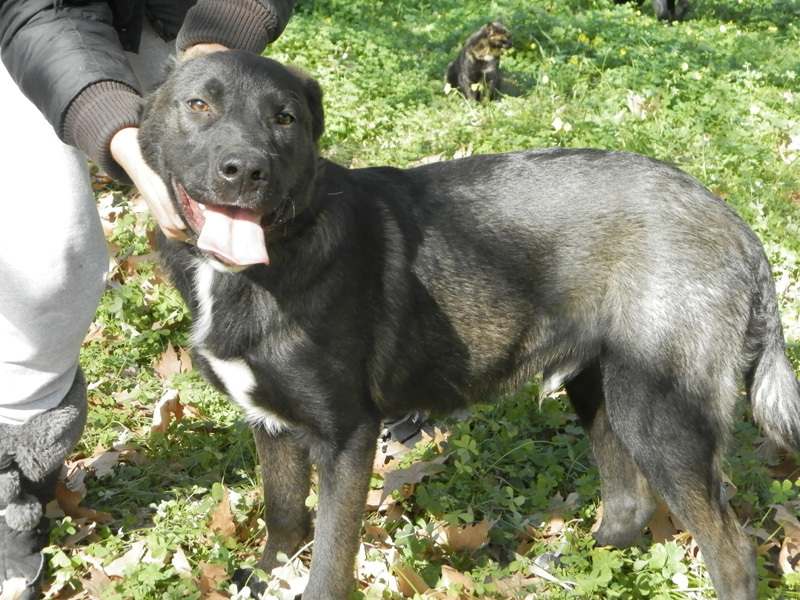 He is calm and gentle with children and he is comfortable with other dogs as well as with cats. As long as there are no goats or sheep to chase he is the most easygoing of fellows. Bob is now living with his sister Akira and his brother Arangon in an enclosure in Amorgos. Unfortunately, due to the lack of foster homes and volunteers on the island, these young dogs are able to spend only a short time with the people who come each day to care for them and they urgently need homes and human attention. Bob’s mother was a pure bred Belgian Shepherd Groenendael and his father was a Greek Shepherd mixed breed. He is one year old, weighs 30 kg, is neutered and fully vaccinated, and his microchip number is 941000016719317. Our great hope is that Bob will find a new and loving family on which to lavish his immense capacity for joyful affection. Watch a video of him here. We have good news through an update on Negra, the all white pup who was adopted by a family in Holland one year ago. Negra has gone through training and she now has a job visiting the mentally handicapped. She has learned how to help them relax and even to help out with small chores, like getting the laundry. Her family is very proud of this amazing dog. Koutcho, now Charlie, was adopted in Holland in 2009, when he was about six years old. He is now a senior dog at 12 year old, but still very handsome (see photo of Charlie with his tie on). We're so happy to get an update from you, Charlie! The civilization of a country is measured by how it treats its animals. Laws prohibiting the physical and psychological suffering of dogs and controls carried out by the authorities, even in private homes, are needed. 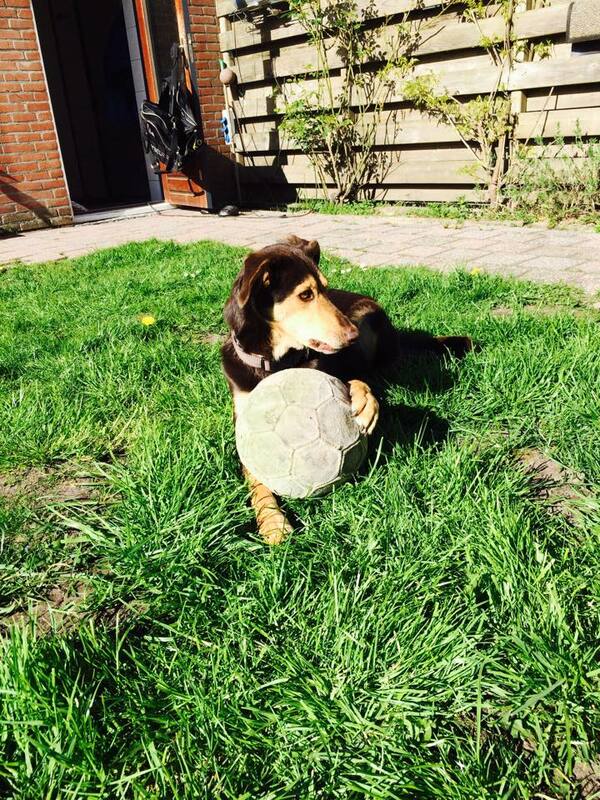 After being adopted in December 2014, Heracles, now Raklee, is happy and healthy and enjoying a wonderful life in Holland. And, as you can see, he is still as handsome as ever! Dr. Vassalakis came to Amorgos on Monday January 19th, 2015. At our center he examined our animals and the animals of many residents whose animals needed healthcare. Luckily Dr Vassalakis had some free time in the morning so residents were able to bring their animals in to see him. 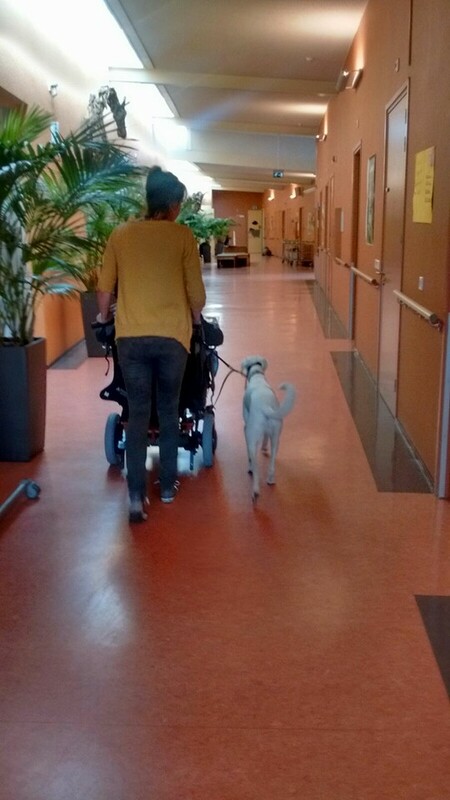 We want to share with you photos from Hera's new life. 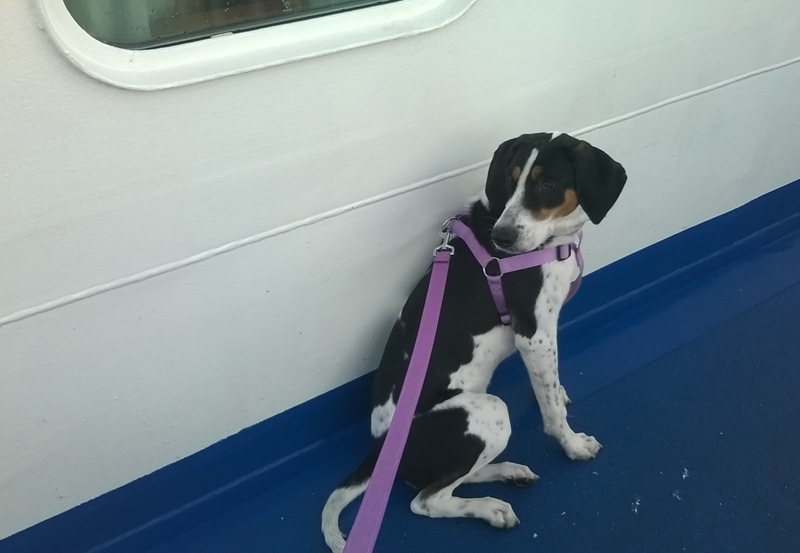 When she was rescued during the summer, she was a young puppy who did not have much of a future on the island. The Fall sterilization program has been completed successfully. Over the weekend of November 8-9, 2014, a team of Greek Volunteers Vets consisting of four vets, one veterinary student and one photographer sterilized 85 cats and 2 dogs in collaboration with local veterinarian Dr. Maria Despoti. The examination room is ready! While in New York we are madly preparing for the Annual Argos Fall Benefit, back in Amorgos, Litsa is madly preparing for a weekend of spaying and neutering. She will be working with 4 vets and one vet student to spay/neuter cats from all areas of Amorgos as well as some dogs. Getting the cat population under control is a major step toward achieving a healthy cat community and improved environmental conditions for everyone on the island. We wish Litsa and the vets the very best this weekend! 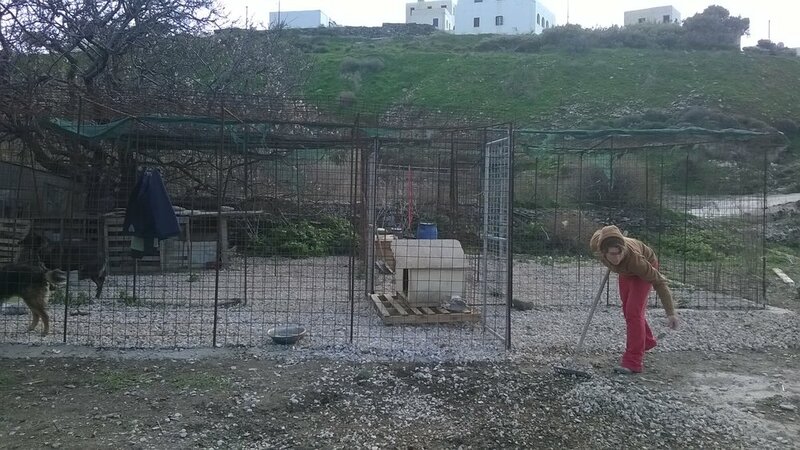 We have built a temporary cat shelter on land that has been lent to AZI by Monks of the famed Monastery of Hozoviotissa. A strong, tall fence has been put up and we plan to move cats, dogs and saved goats there until a permanent place is available. 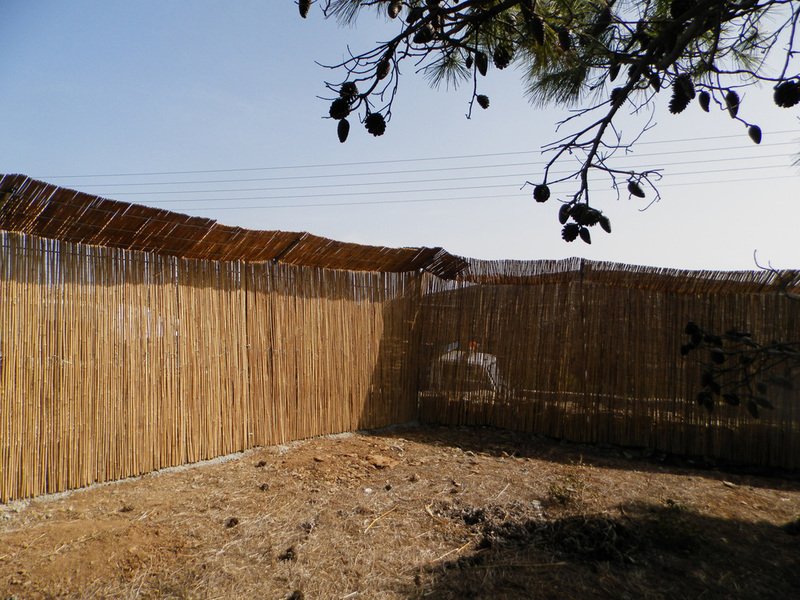 Even as a temporary shelter, it is very beautifully constructed and we believe our cats will love it here. The first residents—6 cats—arrived this week, and as you can see they are happy to run and play in the trees, sunbathe and enjoy themselves. On October 1, 2014, Luna traveled from Amorgos to Athens airport. Later that same day, she flew to Holland where her new family was eagerly awaiting her at the airport. When she arrived, she went to them right away. She was curious about the world which she arrived in but she was tired from the long journey and slept the rest of the way to her new home. She is adored by her family, and she is enjoying everything there from the green grass, cows, riding in the car and sleeping on her new blanket. She loves to play and run and sometimes she is shy, but the cats are getting used to her and the kids love her, so what more can we ask for? We are so happy for her, and wish her the best in her new life! Little Sara has been adopted by a woman who comes to Amorgos from Athens every summer to work in a jewelry shop in Chora. She and Sara bonded right away and now they are never apart. We are so happy that they have become fast friends, and that Sara has found a loving new home. Sara arrived earlier this month, when we received a call from the Mayor about a puppy. A frightened puppy appeared at the school in Chora, so the teacher called the Mayor for help, and the Mayor called us to see if the center could take the puppy. We said yes, so the Mayor himself brought the puppy to our center. The puppy, which the schoolchildren named Sara, is a miniature of Lisa. We guess she is 3 or 4 months old, and it turns out she is a very smart and funny dog. When she arrived, her fur was full of fleas and ticks and she was shaking her ears as if something was bothering her, but she was otherwise in good health. Dr. Despoti gave her a check-up and to check if she has microchip or not. We have looked for her owner, but no one has come forward. Now that it’s been several weeks, it appears she has been either lost or abandoned, so Sara is available for adoption. She is currently living in the center and she has become best friends with Liza. We hope to find this very sweet dog a loving home soon.